Engineers installing and servicing hundreds of installations at some the UK’s biggest distribution depots, have been equipped with rugged tablets connected to BigChange’s cloud-based job management platform. The all-in-one system that includes CRM, job scheduling and integrated vehicle tracking and routing has replaced paper job sheets with real-time electronic reporting, boosting customer service. 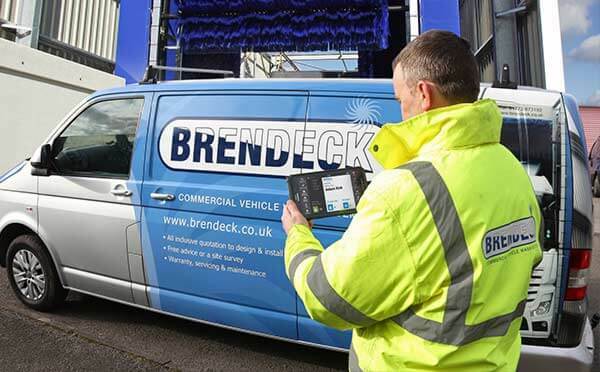 Brendeck provides a one stop shop for commercial vehicle washing and supplies pressure washers and truck washers, together with servicing and chemical supplies. Brendeck washers are used by some of the UK’s largest transport operators with 14 field engineers undertaking Preventive Planned Maintenance work and ad hoc repairs. Prior to the roll out of BigChange, Brendeck relied on handwritten paper job sheets from their engineers. However, to collate and process these paper reports was proving time consuming and there were delays in communicating back to the customer with, for example, quotes for spare parts or further servicing work. Back at Brendeck’s headquarters which are located centrally in Alfreton, Derbyshire, customer services have instant, always-on visibility of the engineers on the road. Brendeck has expanded its services to include the supply of chemicals for its wash equipment and has pioneered a system for remotely monitoring chemical tank levels. Plans are being made to extend BigChange to the chemical distribution service, with vehicle tracking and drivers equipped with BigChange tablets for reporting dispensing volumes and sales onsite.